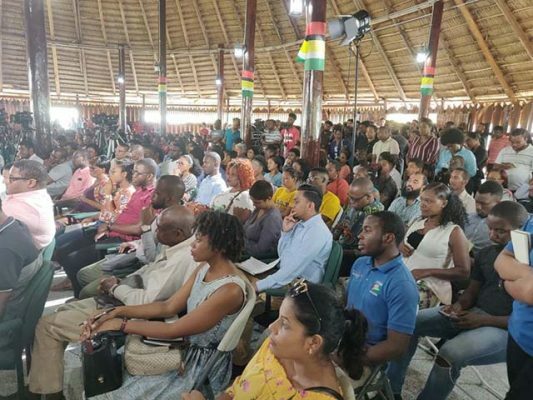 Hundreds of youths yesterday attended an interactive session on the oil and gas sector, where they were sensitised about the needs of the industry and steps to be taken in order to take advantage of available opportunities. The event, held at the Umana Yana, was a collaboration between the Ministry of the Presidency’s Department of Energy, and the Department of Youth, which falls under the Ministry of Social Cohesion. The purpose of the event was to increase the levels of awareness among youth on the oil and gas sector, educate them on the multiplier effects of the sector, and provide an opportunity for young people to participate in the discussion and decision making process with regards to the sector’s opportunities and potential challenges. A section of the crowd in attendance at the interactive session yesterday morning at the Umana Yana. The event saw a large turnout of youths from across the country, with many having to stand after the available seats were filled. Some were not even able to enter the venue as it was filled to its capacity. As a result, arrangements are being made to have the event held again next week at a larger venue. Director of the Department of Energy Dr Mark Bynoe, during his remarks, told the youths that the present and the future of the country rests with them. “We all have a vested interest and we must ensure that we play our full role,” Bynoe said. Bynoe told those gathered that as Guyanese they were raised in the era of rice, sugar, bauxite, and gold, and that the industry of oil and gas must be conventionalised in a similar way. “We have to begin to see this not only as a new industry but also as a new way of doing business,” he said. In terms of the local economy, Bynoe said that there are continuous engagements with the various operators to ensure that Guyanese have an equal share and first preference in whatever is being done. 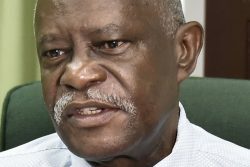 He said what needs to be understood is that the standards in the oil and gas sector are astronomically higher than anything Guyana has ever been exposed to. 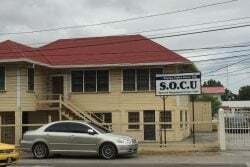 Bynoe said those who are desirous of being considered for employment or services must first register with the Centre for Local Business Development, located along South Road. The centre, he said, offers training that will help equip people to know the dos and don’ts, how they can benefit and how they can better position themselves to take advantage of opportunities moving forward. He further advised the youths that they do not have to change career paths to benefit. “What you have to do is whatever you are doing, ensure that you are the best at it. You don’t have to become a petroleum engineer to benefit from oil and gas. What you have to do is to ensure that you are a certified Guyanese and you can be employed,” Bynoe stated. He further explained that to manage the oil and gas sector, it is important that there are qualified individuals. As a result, Bynoe added that the department has been seeking to recruit those individuals wherever they are present. 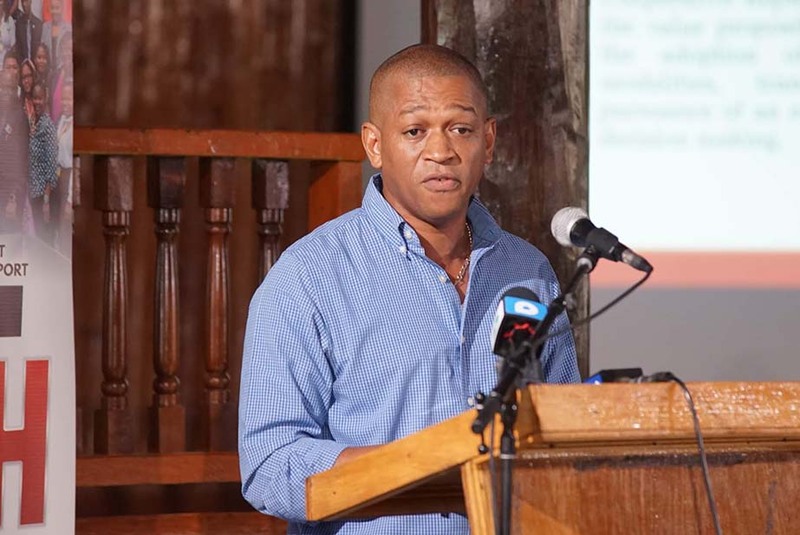 “Knowing there is a dearth of skills within Guyana for this particular sector, our want has been to hire in expertise but to seek to link those expertise with Guyanese persons like yourself so that that capacity can be built as we move forward,” he said. They have also been seeking partnerships and collaborations, Bynoe added. “A country of 83,000 square miles or with a mere population of less than a million will indicate that we cannot do it all by ourselves,” he lamented. He also noted that one of the key pillars of the energy department is transparency. “Much of what the department will be doing is in the light of day and I challenge you, do not sit and take what someone say[s]. Young people should be inquisitive and you should be forcing us to produce more, that ultimately the decisions you make can be informed, can be relevant and can be appropriate. 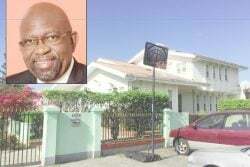 We also have a duty to be accountable, hence everything we are doing is being done from an evidence standpoint,” Bynoe explained. Guyana is expected to commence oil production by the first quarter of 2020, and receive an annual revenue flow of US$300 million. Bynoe said the Floating Production Storage and Offloading facility (FPSO) should be within Guyana by the third quarter of this year. “And we expect production to commence, with Guyana estimating to realize the first tranche of her revenue of $300 million in 2020, and this is not a political gimmick. This is well within the public domain and what we have been speaking about for some time now,” he said. To date, more than 60% of persons directly employed in the oil and gas sector are Guyanese. “Guyana has benefitted directly to the tune of over $65 million US from local content in 2018 alone,” Bynoe related. He noted that there are several operatives in the sector but ExxonMobil has been able to understand the geology of Guyana well and was the first to take the risks. As a result, to date, there have been 10 discoveries in the Stabroek block. The estimated recoverable barrels of oil are in excess of five billion and counting. 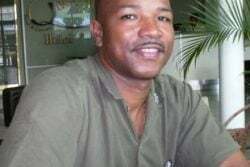 “Given this, therefore, even if we are to do the back of an envelope calculation, the resources coming to Guyana will be substantial and beyond anything you would have seen before,” Bynoe stated.